Had Adam A. and family out Saturday. Started out fluking to no avail with only shorts and a few keeper sea bass for our efforts. Worked some shark baits over the reef with no takers. Looking to bend some rods and find some action we headed out to the lumps in 100ft. Found some life - False albies on light tackle!!! 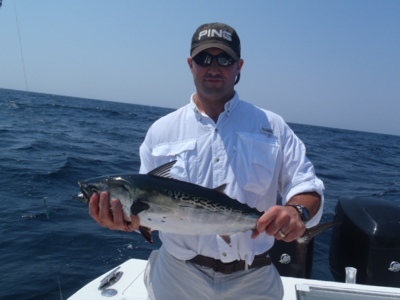 We had steady action and screaming reels with them until it was time to head in. No bonito or any other edibles but it should bust open any time!! Thanks to a great crew! 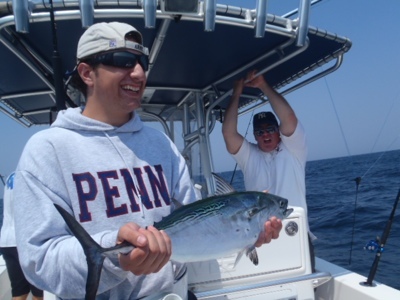 NJ Fishing Reports from Shark Inlet Charters of Belmar, NJ. 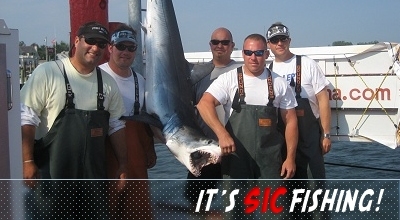 We publish reports for all our charters and specialize in offshore, inshore and bottom fishing out of Shark River Inlet in Belmar, New Jersey. Our inlet is in close proximity to the legendary fishing grounds of the Shrewsbury rocks, the Mud Hole, and one of the closest inlets to the Hudson Canyon.